Metallic crystals are helpful crystal tools offering reflective viewpoints enabling one to look at a situation in complete detail. A combination of cubes and octahedrons with a beautiful metallic luster form this Pyrite Cluster crystal from Peru. Iridescent peacock blue and purple colored Chalcopyrite with Bornite specimens from Mexico. Gorgeous black-brown-red Botryoidal Hematite Specimen with a beautiful metallic luster from Morocco, Africa. Spectacular and gorgeous Copper Sphere from the Copper Country of the Upper Peninsula, Michigan, USA. Fun and glittery spectacular, extra large sized specimen of iridescent Peacock Ore with Bornite, also known as Chalcopyrite with Bornite, from New Mexico, USA. Covellite tumbled stone with a beautiful blue metallic shimmer from Smithville, Colorado, USA. Beautiful blue hued metallic rainbow stepped man made Bismuth Crystal. Beautiful rainbow silvery blue colored stepped man made Bismuth Crystal. Beautiful silvery blue and golden hued stepped man made Bismuth Crystal. Sparkly Pyrite with Calcite in Quartz Natural crystal specimen. Amazing 4600 Million Year Old Nickel Iron Gibeon Meteorite. Visually intriguing, these amazing Mary Ellen Jasper tumble stones are from the Mesabi Range, Minnesota, USA. 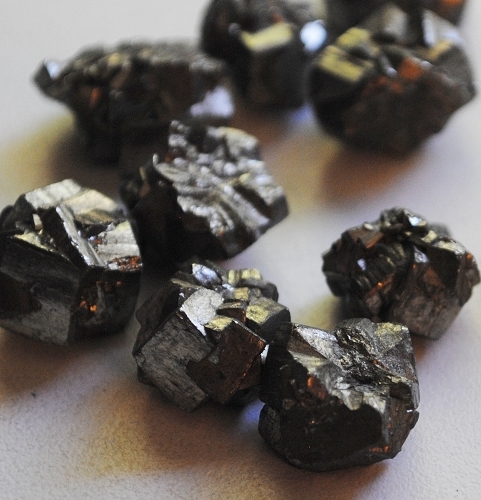 Magnetite, also known as Lodestone, is a grounding stone that provides a balancing and calming energetic vibration. Spectacular Float Copper specimen from Copper Country, Michigan with a natural patina finish caused by oxidation from exposure to soil, water, air and elements of nature. Shiny tear drop shaped Copper pendulum.